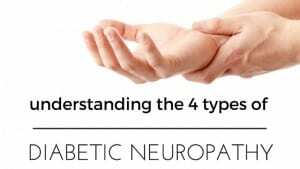 Understanding the 4 Types of Diabetic Neuropathy - Piedmont Physical Medicine & Rehabilitation, P.A. What is diabetic neuropathy? Diabetic neuropathy occurs when the effects of diabetes damages nerve fibres. The relationship between the two cannot be precisely mapped out or explained, but high blood glucose levels have shown to be a major factor in nerve damage. The location of pain is relative to what nerve is damaged, and can occur in all parts of the body. It affects an estimated 20 million people in the US alone, demonstrating to be a common issue amongst diabetics. 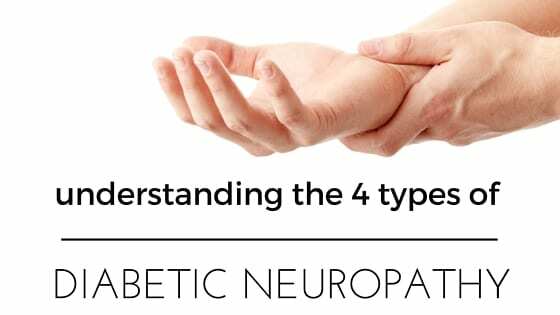 It is often an underlying issue, and not commonly talked about; people are suffering from these 4 types of diabetic neuropathy without knowing why. There are many facets to diabetic neuropathy, but there are 4 major types you should know about. Our bodies are complex, so breaking it down into categories helps us differentiate what part of the body is involved and which nerves are affected. Knowing these 4 types will help you understand neuropathy better, as well as what symptoms to look out for if you suspect you have neuropathy. Peripheral neuropathy is a result of a damaged peripheral nervous system. The peripheral nervous system links the central nervous system (the brain and spine) to the extremities of your body — such as your feet, legs, arms and hands. This is the most common type of diabetic neuropathy. It has a tendency to target legs and feet more often because there are several long nerves leading to those areas. This can also be described as polyneuropathy since more than one nerve is affected. Those with peripheral neuropathy experience numbness, tingling or prickling sensations. It can also cause muscle weakness, and in more severe cases, induce pain stimuli such as burning. It’s important to continually check the areas where numbness or other sensations occur. Often times, a wound or infection develops around the area and goes undetected. This can lead to further complications with your health, so it’s important to do daily examination of your body if you experience these symptoms. The second most common type of neuropathy is proximal neuropathy, also known as lumbosacral radiculoplexus neuropathy. This kind of neuropathy causes numbness and predominantly muscle pain near or proximal to the hips, buttocks and thighs. It is not unlikely for individuals to feel a shooting pain starting from the lower back region down towards the legs — this is how some patients distinguish their first symptom. It also tends to only affect one side of the body, but can spread to both. Proximal neuropathy inhibits many from mobility, as pain can be unyielding, also causing leg weakness. It is more common amongst the elderly, but continual and consistent treatments and care have shown to subside pain. If you experience any these symptoms, it’s best to go to your doctor right away. Proximal neuropathy may start out with minor pain, but it has the potential to become intense very quick. It’s better to get an examination before the suffering worsens. Autonomic neuropathy occurs when there is a nerve disruption between the central nervous system and the internal organs — such as blood vessels, sweat glands, pupils, lungs, heart, bladder and intestines. This means that daily bodily functions, such as blood pressure control, heart rate, sweating, digestion and bowel and bladder movements are affected. There are many symptoms that can occur with autonomic neuropathy. Some include abnormal heart rate, high blood pressure, nausea, bowel problems, difficulty urinating, excessive sweating, unexpected weight loss as well as sexual dysfunctions. It may be difficult to pinpoint autonomic neuropathy because symptoms aren’t always consistent, but there are many avenues for treatments depending on how your body is affected. Let your doctor know what has changed with your body and how it functions. They can pair you up with the right diagnosis. Symptoms of autonomic neuropathy can be difficult and embarrassing to talk about, but when your health is on the line, it’s better to be safe than sorry. Focal neuropathy is the least common type. Unlike the other forms, focal neuropathy affects specific nerves — at most, only a few nerves are damaged. This is why symptoms are central to a small region or area. It occurs most often in the head, torso or legs. Those with focal neuropathy experience double vision, pain behind the eye, Bell’s palsy (paralysis on one side of the face) and bodily pain with the chest, stomach, lower back, pelvis or foot. Abdominal pain can also occur, which is often mistaken for heart disease or a heart attack. It’s best to remember that neuropathy does not only affect external sensations, but also can disrupt daily bodily functions. Be aware of your body and your daily activities and any changes that occur with your health. The best way to prevent diabetic neuropathy is to keep your blood glucose levels safely in check by maintaining a healthy lifestyle; this includes exercise, diet and overall wellness. In turn, your nerves have a better chance of functioning normally and safely.